Successfully Added King Kong Multi-Tool Shovel - Hoe, Axe, Compass, Knife, Ferrocerium Rod, Durable High Carbon Steel + Aviation Aluminum, Case to your Shopping Cart. The King Kong shovel is your versatile survival tool for when the zombie apocalypse hits. This multi-tool includes fire starter, compass, shovel, knife, axe, bottle opener, hex wrench and makes a great defensive weapon should the walking dead get too close for comfort. With its full complement of uses, this shovel is great additions to your camping, hiking, fishing, backpacking, off-road driving and other outdoor adventures allowing you to built a shelter, stay warm and keep yourself safe outdoors. Made from a high carbon steel and aviation aluminum alloy its lightweight and durable, the handle separates into 3 parts and the shovel head is fully detachable. 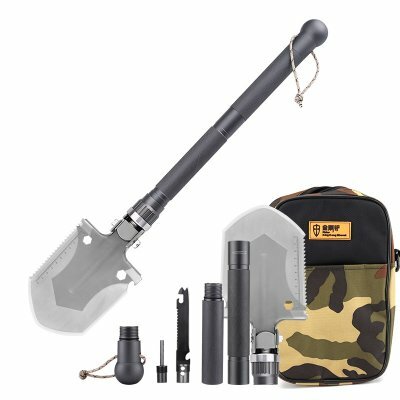 With an anti-slip handle and adjustable shovel head you can use the King Kong shovel as an axe, hoe, shovel or saw for hacking and slashing your way through overgrown terrain, clearing a and leveling a campsite, digging a latrine or fighting off wildlife. The second section of the handle encloses a 3.5 inch blade knife which can screw into the handle base replacing the ferrocerium rod. With it's serrated saw edge a forked tip, bottle opener and holding a sharp blade edge you have everything for cutting and chopping. The shovel head itself can be adjusted allowing it to be used as a shovel, hoe or axe and its bladed edge can be used to chop wood, dig and level ground or take apart the occasional zombie. Coming with a carry case, and shovel head cover this multi-tool shovel can be taken down into its main parts making it easy to pack and carry allowing it to take up very little room in you pack or car. The Rider King Kong shovel comes with 12 months warranty, brought to you by the leader in cool gadgets devices as well as wholesale outdoor tools and gizmos..